Great family house located 10 minutes from Morzine. Perfect for 2 or 3 families. In winter you can enjoy the ski slopes of the Portes du Soleil, in summer you can enjoy the private swimming pool. The house has 7 nice bedrooms (one with three singles, one with two singles and five doubles) and there is place for 14 persons. There are 2 bathrooms and an extra shower. On the ground floor you find the kitchen, living area, television room, dining room and working room. Outside there is a big veranda to have dinner or to just have a great view of the Alps. 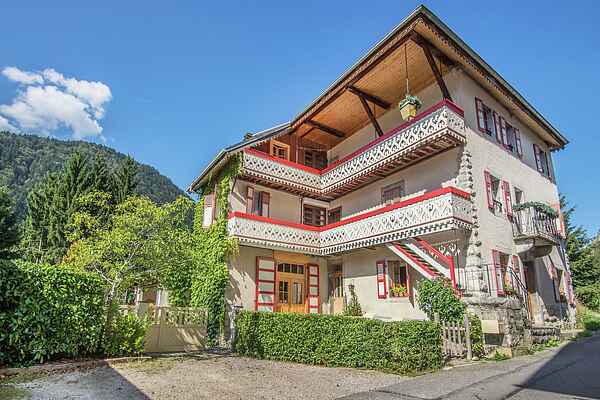 The house is located at a quiet street - 300 meter from the center of St.Jean D'Aulps. It's a 10 minutes to the Portes du Soleil with connections to Avoriaz, Les Gets, Morzine and Chatel. In winter there is a shuttle bus next to the house, which brings you to the ski lifts. You can walk to the center of the small village to buy groceries, fresh croissants,have dinner or rent your skis. In summer, you can enjoy the private swimming pool in the garden.There are many sports you can do: mountain biking, hiking, running, tennis, rafting and sailing. Or go shopping and sight seeing in Thonon (25 min), Evian, Geneva and/or Lausanne (take the ferry from Thonon).